It's been a year now since Emma's passing. Our lives have changed so much since then, yet I still feel like it was just the other day. But today it has been one year and I am celebrating! In a little bit I plan to make her a birthday cake with the boys. I also hope to stop by the cemetery later today. I don't know why, but I don't feel like today should be a day filled with sadness. Instead I feel it should be a day filled with joy. I want to celebrate the amazing spirit she was. I don't think I'm any different than other moms who have lost children in saying that a single day hasn't gone by that I haven't thought of her. I like it that way. Thinking of her doesn't make me dwell on the sadness of losing her (usually). More often than not it brings a smile to my face. She's always with me. Do I miss her? Oh yes. Do I wonder what life would be like if she hadn't died? Definitely. But things are the way they are and I know that someday we will see her again. So today I celebrate you Emma! I love you Tiffany and all that you and Emma have taught me. HAPPY BIRTHDAY EMMA! Happy Birthday Emma! Emma has taught us so much about the purpose of life and cherishing the things that are most sacred. I have an older brother who died the day he was born. We always had an angel food cake on his birthday. You are such an inspiration to me, Tiffany! Happy Birthday to Emma! You're the best mom I know. Welcome to Emma's Story. It all began in June of 2008 when my husband and I found out that our family of four was going to become a family of five. 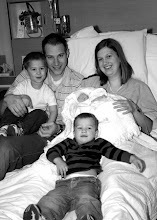 Things took a drastic turn, however, when in September of 2008 our baby girl was diagnosed with anencephaly. We had people across the world praying for us and for Emma that God would provide us with a miracle and that baby Emma would be born alive and be able to spend just a few moments with us. However, Heavenly Father had a different plan in mind and Emma died during labor and was born in the evening of the 15th of January. However, we have learned that the true miracle lies in the Atonement of our Savior Jesus Christ and in eternal families. If you have any questions, comments, stories, or anything else, you can contact us at EmmasStory@gmail.com. Thank you for traveling this journey with us. Anencephaly is a defect in the closure of the neural tube during fetal development. The neural tube is a narrow channel that folds and closes between the 3rd and 4th weeks of pregnancy to form the brain and spinal cord of the embryo. Anencephaly occurs when the "cephalic" or head end of the neural tube fails to close, resulting in the absence of a major portion of the brain, skull, and scalp. Infants with this disorder are born without a forebrain (the front part of the brain) and a cerebrum (the thinking and coordinating part of the brain). The remaining brain tissue is often exposed--not covered by bone or skin. A baby born with anencephaly is usually blind, deaf, unconscious, and unable to feel pain. Although some individuals with anencephaly may be born with a rudimentary brain stem, the lack of a functioning cerebrum permanently rules out the possibility of ever gaining consciousness. Reflex actions such as breathing and responses to sound or touch may occur.